August 12th: Star Wars signing. Richard LeParmentier (Star Wars: Admiral Motti) and Jerome Blake (Star Wars Episode 1: Phantom Menace's Rune Haako and others), in town for GenCon, appear at South for a signing session. This is Steve Dobrzynski's first promotional event. The turnout is abysmal. August 26th: Jef signs the papers, backdated to 7/6, finalizing the sale of the stores. September: Shane Mervyn works the counter at South on Saturdays. November 7th: Shane Mervyn takes over the North store. January 16th: Jef goes to the big comic shop in the sky, where you can buy Action Comics #1 for cover price and no one has heard the Watchmen speech yet. Tara Gulden starts employment at South, Tara Gulden's employment ends. Kyle Davis joins the Edge at South. February: Marvel Comics decides to severely cut back on overprinting, making reorders on all marvel titles scarce. March 11th: John is called by WTMJ to discuss Kingdom Come, X-men movies, and other comics stuff. April 17th: Kevin and Shane catch a kid starting the garbage dumpster at SOUTH on fire. The kid escapes on bike, and they struggle to put out the fire, calling the fire department and the police. April 25th: 7:42am the "unfound" radio commercial premiers on ROCK 102 One FM. Steve attends an advanced "press screening" of the movie X-Men 2 courtesy of ROCK 102 One FM, after which he immediately called the South store to brag about how great it was. June: Steve has some cosmetic work done on South, installed glass block windows, paints a neighborhood skyline based on the actual neighborhood that includes a Jef figure. August: The south front window is cracked (due to weather) and replaced. Al Frank replaces the Superman / Hulk paintings with a "Flash of Two Worlds" homage. September: A huge American flag, left in the shop by Jef, is placed behind the "Flash of Two Worlds" window, in remembrance of the people who died in the World Trade Center and Pentagon Sept. 11th terrorist attacks. November 16th: Kevin sends out the Edge's first press release, about Dark Knight Strikes Again. Early December: Due to controversy resulting from a difference of opinion on what the EDGE FANZINE should be…. Luke Spanton resigns as editor of the EDGE newsletter. Late December: Jef's grave gets a headstone. January 6th: Annual New Years Sale at South. January 12th: 2nd chance New Years Sale at West. Carter Zawicki (1 1/2 years old) purchases his first comic (Batman: The 10 Cent Adventure) from West store manager John Steib. January 13th: 2nd chance New Years Sale at North. Late January: Free Comic Book Day 2002 is announced. Construction on CollectorsEdgeComics.com begins as a work in progress. Mid February: The retired EDGE FANZINE is resurrected in digital form on CollectorsEdgeComics.com. It is now known as the EDGE Newsletter On Line. February 21st: "Clean buildings, nice buildings bring customers," Dobrzynski says in a Milwaukee Journal-Sentinel article about his building renovations to the South store. March 8th: The Edge Newsletter Online receives its first hate mail. Collector's Edge becomes a registered CGC dealer. Early April: Kevin starts the plans for a new Edge Computer. A guy walks into the South shop to sell some comics and since Steve offered a lower price than he demanded, the guy proceeded to tear up the comics and storm out. Mid April: Kevin gets hit with a mysterious virus and ends up in the hospital for 4 days. Steve quickly catches up on package system changes. Early May: The new Edge PC is built. It is 7 times faster than the old. Shane Mervyn is the featured comic book expert for The PRESS, a neighborhood newspaper. He discusses Spider-man. May 3rd: The long awaited Spider-Man move opens. Collector's Edge does a free comic give-away tie at South Shore theatre. May 4th: Free Comic Book Day. Fan response is good, but not great. May 6th: The Collector's Edge TV commercial airs during the 10 PM Simpsons rerun. May 24th: The new PC goes online. Kevin claims it is the fastest PC of the time. May 25th: South is robbed in a grab and run incident. Kyle takes three days to recover his nerves, Steve gives a foot chase, Brian gives hot pursuit in his car. Late May: South store has more exterior cosmetic improvements done. June 2nd: The "annual" Mighty Mervyn Meat Fest is held. Many Edge guys get the meat sweats. June 27th: Present and past Edge Guys gather in remembrance of Jef Parker. July 13th: Mike Lang (a South package customer) joins the Edge staff. He is known as "RoboKyle" and trains under the watchful eye of Fanboy Kyle. Steve calls him "Mark" for 2 weeks, before he is told his name is actually Mike. Late July: Shane and Rogman are attacked by bees while moving a couch off Shane's porch. Shane, chased by the aforementioned bees runs down an alley, trips, and ends up with one arm in a sling. Rogman reportedly defeated the bees with Kung-Fu. August: Shane Mervyn is quoted twice in the August 2002 issue of The Comics Journal. NEWSWATCH State of the Comics Industry 2002: Recovery or Decline? Shane Mervyn, manager of Collector's Edge in Milwaukee, Wis., said, "The most important thing is to keep the stores clean and the racks full. I don't now about you, but I've been to a lot of comic stores where there is some some fat guy eating chicken all over the place, and that's just bad business." Collector's Edge manager Mervyn, who has been in the business for 27 years said recent sales have been steady, with no drops. "The future looks good," he said. "As long as they keep coming out with toys, and Marvel keeps putting out good stuff. I don't forsee any problems." Shane has no recollection of this, has not been in the business for 27 years, and would like to note that he does enjoy a good chicken dinner once in a while, just not all over the store. Early August: The "Jefhead" business card is retired, the supply finally running out. An updated card is created that includes our web site address. August 25th: While doing some external building repairs at South, Steve falls from a ladder and calls Kevin via his cell phone for help (Kevin was in South office at the time). Kevin hastily forms an uneasy alliance with the neighborhood morlocks and, with their assistance, manages to drag Steve to cover. After a quick ambulance trip and some rest Steve eventually recovers. Sadly, the ladder was damaged forever. August 28th: Kyle leaves the Edge, heading off to Madison, WI for college. He will be missed. 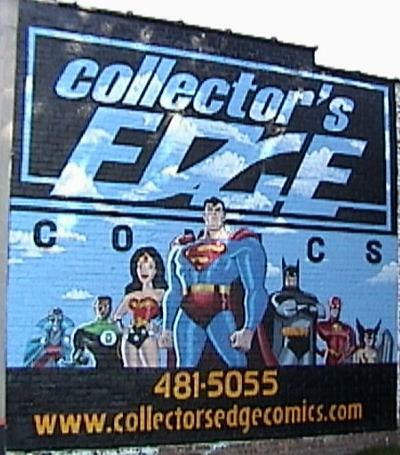 September 11th: Collector's Edge Comics wins a Power Company "Virtual Store Appearance" by Tom Grummett, co-creator of DC Comics Power Company. Mid September: Free Comic Book Day 2003 is announced, date pending a retailer vote. Mid September: The giant painted Spider-Man sign at South is cleaned and work begins on its replacement. September 27th: South gets a new painted wall sign, featuring the Justice League from JL Animated. October 14th, 16th & 17th: Courtesy of Collector's Edge Comics, Kurt Wood (long time West customer) gives a talk on comics for the Milwaukee Federated Library's "Get Graphic @ Your Library" program. The talks are held at the East Library, Bay View Library, Forest Home Library. October 21st: A Collector's Edge Comics ad is run in the Onion. 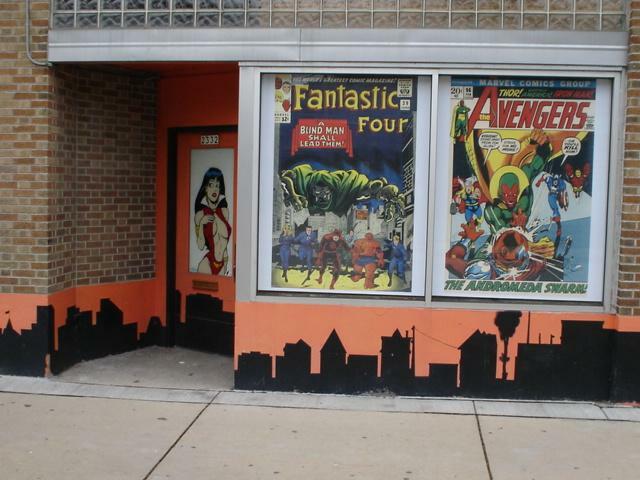 October 24th: Collector's Edge Comics is featured in a "Guide To Comic Shops" in OnMilwaukee.com. Early November: Kurt Wood (long time West customer) joins the ranks of the Edge Guys, working West on Sundays. November 3rd: Detective Comics #776 ships with a cover by Collector's Edge alumnus Brian Ewing. 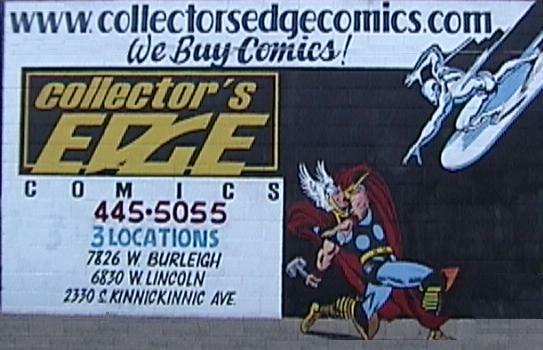 November 21st: North gets a new painted wall sign, featuring the Thor vs. Silver Surfer. December 10th: Steve and Kevin do a 1 hour teleconference with a marketing firm conducting research for Dark Horse Comics. December 26th: UPS decides to change the shipment day to Friday and doesn't tell anyone... chaos ensues, the Edge Guys rally and recover. December 29th: For the first time the (upcoming) New Year sale will be open to the public (for some of the time). In preparation, a classified ad is run in the Journal-Sentinel. February 18th: Kurt Wood takes over the store manager position at North. February 19th: A severe winter storm hits the northeast, delaying the comic shipment by a day. Mid April: West interior gets remodeled, walls redone, updated layout. April 26th: Drive-In, an independent film from Solar Winds Production shows at the Eisner Museum theater. Collector's Edge SOUTH was used as a shooting location. May 2nd: X-Men 2 opens to huge expectations. May 3rd: Free Comic Book Day 2003. June 4th: The first (of 12) "Geek Of The Week" column, featuring Collector's Edge Comics customers, appears in the Onion newspaper. June 13th: Kurt Wood, managing North, has an interview in The Press, discussing the Hulk movie and superheroes on the big screen. August 20th: The last (of 12) "Geek Of The Week" column, featuring Collector's Edge Comics customers, appears in the Onion newspaper. 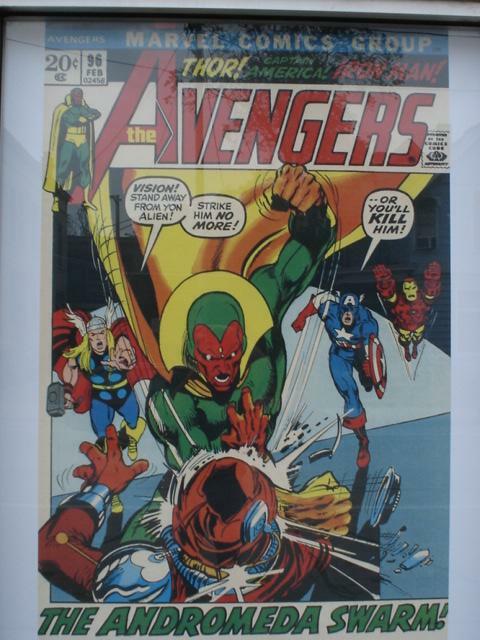 September 5th: A Collector's Edge Comics advertisement appears on the big screen. Shown before every movie (all screens) at Marcus South Shore in Oak Creek & Marcus Westown in Waukesha. The ad will run for a full year. October: Dave Rogman hosts several Heroclix tournaments at South on Sundays. October 17th: In the Shepherd Express annual "Best Of Milwaukee" reader poll, Collector's Edge Comics is voted best comic shop. December 4th: Steve, Ilija, and Dave Rogman attend the Shepherd Express awards dinner. Steve accepts the "Best Of Milwaukee" award for best comic book shop. When asked to say a few words, he replied, "If you are not reading comics now, you should be!". Ilija did not get dessert, but Rogman did. January 1st: North is robbed by a gun-wielding robber. Kurt lived, but he will never feel the same when lying on the floor behind the counter again. Happy New Year. January 4th: The 2004 New Year Sale (SOUTH). Packers win, much fudge eaten, lots of happy customers. January 10th: 2003 New Year Sale (WEST) Nathan Zawicki (1 year old) purchases his first comics (Hulk and X-Men) from West store manager John Steib. February 28th: Mike Lang innocently finishes his work at South for the day, gets in his pick up truck, pulls out of the back parking lot, drives down the alley, looks both ways, turns onto the street and… wham! He collides with an oncoming car, totaling it. He walks away unscathed, thinking “good thing I had fast relexes ”. March 5th: Keith Dawson starts basement training under the expert tutelage of Mike Lang. Is he the next Edgeguy? He is inducted under the name Kyle3 (pronounced "Kyle Cubed"). When he asked "Why Kyle3? ", Steve grunted back, "why not...". April 23rd: Kurt informs the Edgeguys that he is engaged to his longtime love... later this season he reveals his alter ego to her, leading up to next seasons cliffhanger wedding episode. Early May: Collector's Edge Comics wins a "2004 Customer Service Award" from the Comic Buyer's Guide. This award acknowledges that the recipient conducted his business in conformity with the rigorous standards required by the advertising policies of the Comics Buyer's Guide. July 3rd: Free Comic Book Day 2004. July 20th: Mike Lang departs, joining the U.S. Air Force. August 1st: Dave Mehling "retires" as South manager, but continues on a part time basis. Ilija and other reserve Edgeguys are temporarily re-activated. September 1st: Diane Bluma (a South package customer) joins the Edge staff. At first she is only known as "that chick Steve hired". September 12th: Diane Bluma becomes Diane Eells, marriage being the second most important event in her life after becoming an Edgeguy. 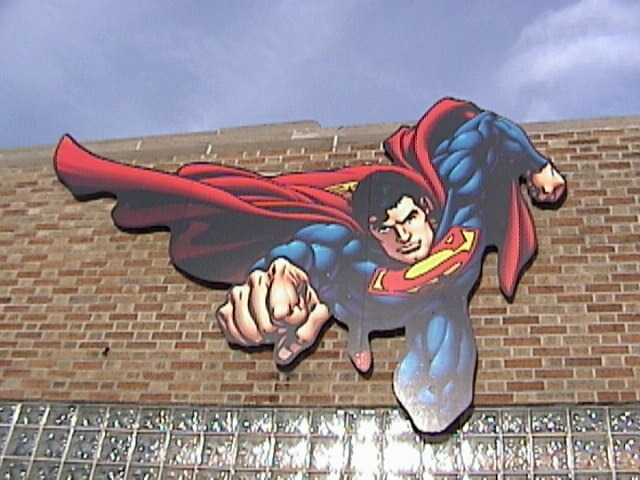 September 22nd: A giant "Superman flying at you" sign is added to front of South. October 6th: Cosmetic and structural repairs to South. 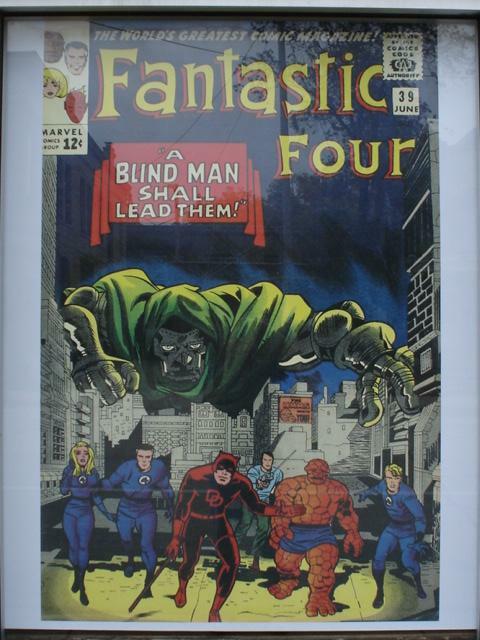 October 15th: South gets giant front window inserts showing Fantastic Four #39 & Avengers #96. 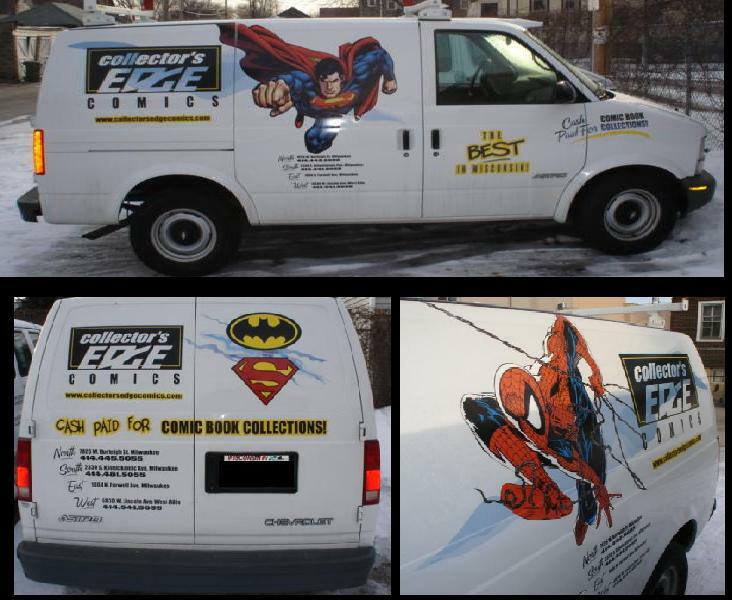 November 11th: Collector's Edge Comics is VOTED BEST COMIC BOOK SHOP by the Shepherd Express Best of Milwaukee 2004 reader poll. January 2nd: 2005 New Year Sale (SOUTH). January 8th: 2005 New Year Sale (WEST). January 9th: 2005 New Year Sale (NORTH). January 14th: Zombie Afoot In Bay View article appears in the Bay View Compass. Steve is interviewed by the new local community newspaper. March 2nd: The Edgevan gets a new paint job. March 4th: Collector's Edge Comics EAST is announced. April 1st: Jo Schmidt joins the Edge staff to supplement South. He is designated "Joe Kyle", Kyle being his given name and thus continues the Kyle line. William Hunt joins the Edge staff to help pioneer the East territory. He is designated "that guy working for that chick at East".